Anyway, I wanted to make pies for my next Apple vs. Pumpkin bake-off. I have made an easy peasy apple crisp for YEARS and everyone loves it. It takes about 45 minutes in total to prep and bake. I could have easily cranked out an apple crisp in no time. But that would have been too easy for me. No…I’ve got to have a challenge. 🙄🙄🙄 I decided instead to make a homemade apple pie. I apparently LOVE to make things difficult for myself. (Insert Sarcasm here.) So not only did I shy away from the easy and quick recipe, I decided to go for an even bigger challenge and make my own pie crust. Now, I have to explain—I can barely handle the pre-made crusts. I get jello hands or something whenever I touch them and everything falls apart. 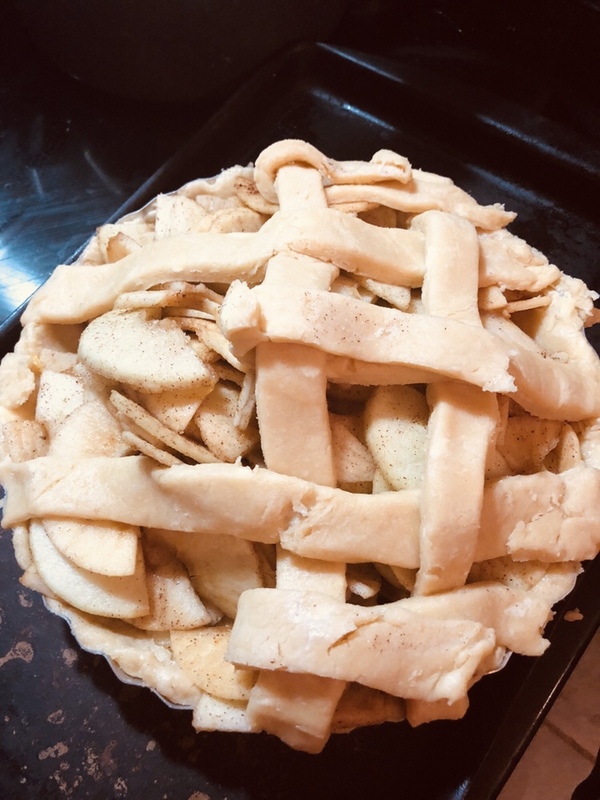 So maybe I should have mastered the pre-made crust before I attempted the homemade pie crust, but this recipe I found promised this was soooooo easy that a monkey could do it. I guess I should have hired a monkey to help me. The pie crust was a separate recipe. It was pretty labor intensive and not exactly “easy”. However, have you ever tasted pre-made pie. crust? It’s not all that delicious, so I figured it would be worth the shot. The problem was, I had to make two of the pie crusts for the one pie, a fact I didn’t realize until after I started the process. By then I was committed and I wasn’t giving up. First off, the butter. It needs to be cold. Apparently this is the key to a flaky, buttery crust. The butter melts when baked, the steam creating air pockets. So I cut the butter into tiny cubes (which is much easier than cutting potatoes into cubes since butter is already square 🙄) and cut the butter with the butter Crisco, salt, and sugar, and flour. You want the butter to be about marble size when you’re done (therefore, don’t work it in too much). I used a fork because I don’t have a pastry cutter. This resulted in a very sore right arm for me. Then whisk the egg, vinegar, and 4 TBSP of ice water together in a bowl. Add it to the flour/butter mixture and using the pastry cutter (fork) combine. Don’t overwork the dough. You still want small pea-sized pieces of butter in the dough. Then place two 12 inch sheets of plastic wrap on a clean surface (overlapping). Place the dough ball on top. Then add two more overlapping sheets of plastic. Squish down the dough into a disk and stick it in the fridge for a half hour. Also, place the pie dish in the freezer at this time—this helps with all the flaky crust. While the dough was in the fridge, I preheated my oven to 425. Then I peeled the apples using my apple peeler corer slicer from Pamper Chef. This is one of my favorite kitchen tools. I’ve had this baby for almost 17 years: I used a mixture of Granny Smith and Honeycrisp—I like that combo. The Honeycrisp is really sweet and the Granny Smith is a bit tart. 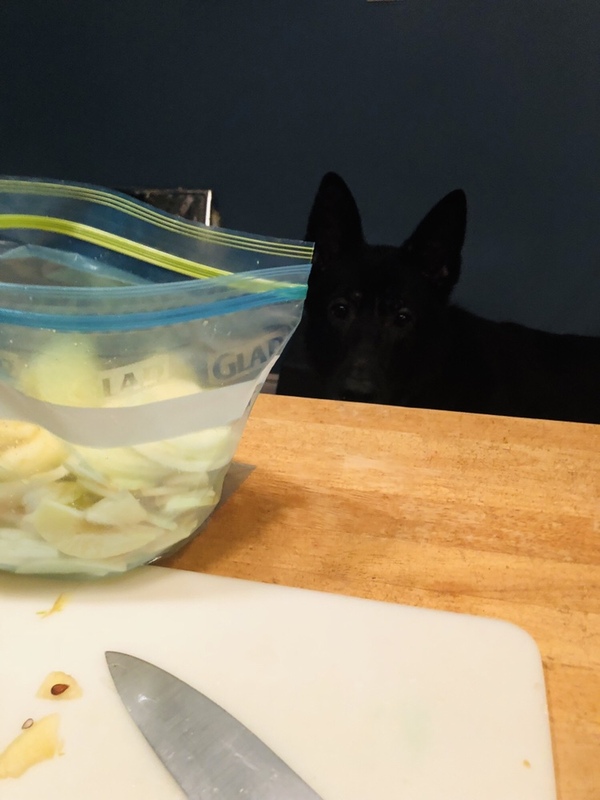 Stick the peeled and sliced apples in a plastic bag along with the cinnamon, lemon juice, lemon zest, and cloves. I actually zested my finger by accident. While zesting a lemon. It reminded me of that line in The Princess Bride when Billy Crystal says “Why don’t you just give me a papercut and pour lemon juice in it?” 😬😬😬 Ouch. Shake up the bag. Ughhhhhhh. Take the crust out of the fridge and take the pie plate out of the freezer. Lay the crust on a clean surface and roll it out into circle that is two inches bigger than the pie plate circumference. This makes the lattice pattern: (My picture isn’t the best, but it gives you an idea of what I’m talking about.) Brush the crust with a beaten egg yolk. 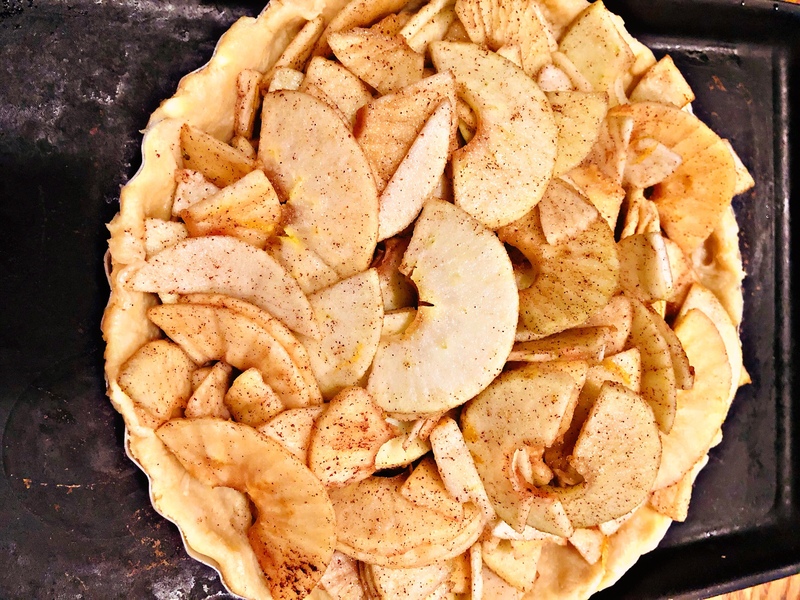 Put pie in the preheated oven at 425 for 5 minutes and then reduce the heat to 350 for the remaining 35-40 minutes, or until crust is golden and apples are tender. Don’t Dig in Right Away! My pie didn’t come out exactly how I envisioned it, but I have to say, the crust was flaky and tasted much better than the store brought stuff. I also need to work on my lattice pattern—the strips I made were too thick, so they were difficult to work with. 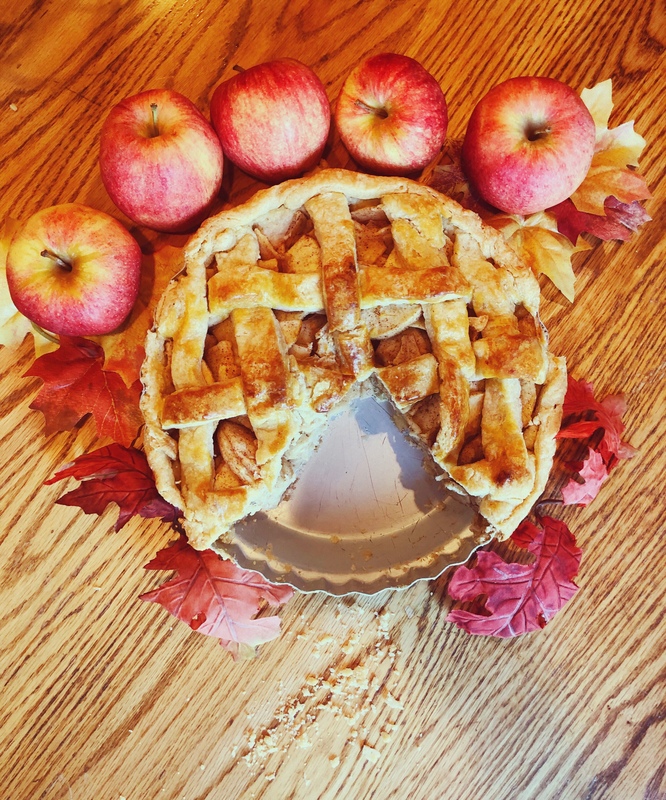 But the pie still smelled and tasted pretty awesome…and that’s the most important thing. When you remove the homemade apple pie, let it sit for an hour before serving. I know it looks and smells delicious, but you don’t want to burn the roof of your mouth! Enjoy!